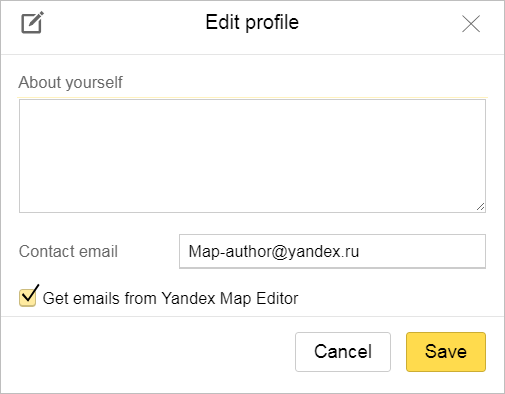 Every Yandex Map Editor cartographer has a User profile that is created automatically when they sign up for the service. Your profile contains information about your contributions to YME. To see your profile, click on your username and select My profile in the menu that appears. You can also change the interface language (such as Russian, English, and others) in the Language field. 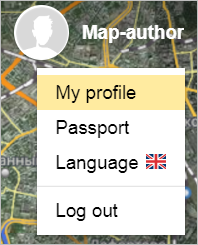 If you haven't logged into Yandex before opening the map, you can change your language by using the button in the main window. A “Moderator” designation if you are a YME moderator. E-mail for communication - the address where notifications will be sent for a specific user about updates to satellite images of the territories they are monitoring (see Subscriptions) or moderated, about Yandex updates.Maps that affect its corrections. If you don't want to get these notifications, un-check the flag next to Get emails from Yandex Map Editor. ( ) — made more than 50 edits in the old Yandex Map Editor, or 1000 edits in the new Yandex Map Editor. The icon displays the interval for the number of corrections: 0-50, 51-100, 101-500, 501-1000, and so on. So if two users made 510 and 990 edits respectively, then their profiles will display the same pictograph: “Made more than 500 edits”. — 2 years on Yandex Map Editor. 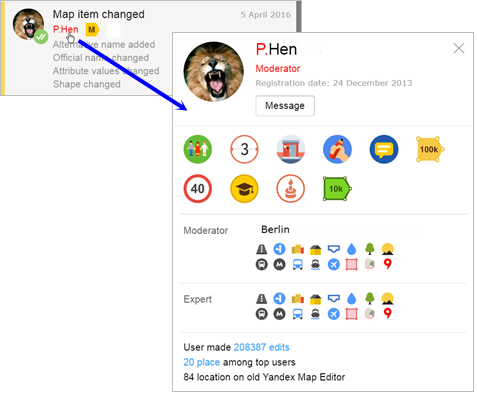 — Drew on the new Yandex Map Editor on the day it launched. This section also displays other pictographs (for example, and ). You can find out what each pictograph means by holding your cursor over it and reading the tooltip. The Expert status means that a user has a particular expertise when drawing objects of a certain type (a certain map layer). 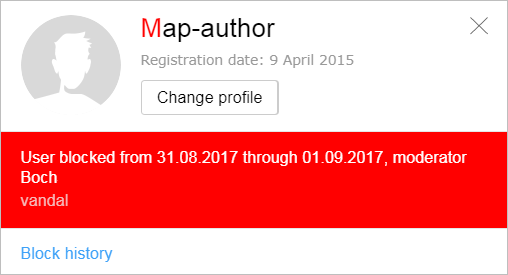 Users are awarded the status if they have been drawing particular map layers for an extended period of time with no mistakes. Edits made by Experts pass the first layer of moderation automatically, and are faster to get into the production pipeline for a manual check-up. — The number of edits in the Yandex Map Editor and the user's overall mapping rating. 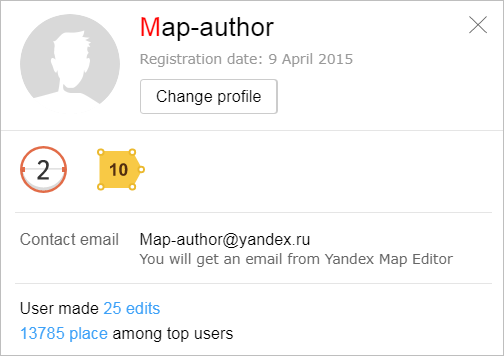 If you click on a rating, you will see a list of authors who worked on Yandex Map Editor. The number of edits each user made and their “Top users” rating are indicated there. Top users sorted in descending order of ratings and allows you to view information for a selected period (press a button: For all time / week / month / quarter). Additionally, you can click Go to top to view the top users. To see the entry about yourself (marked “you”), click Find me. Information about why you were blocked: if you were blocked by the moderator. Click More to open your list of violations. The same message appears on the screen. To view your detailed violation history, click Violation history. To send the user a message, click Message in their profile.